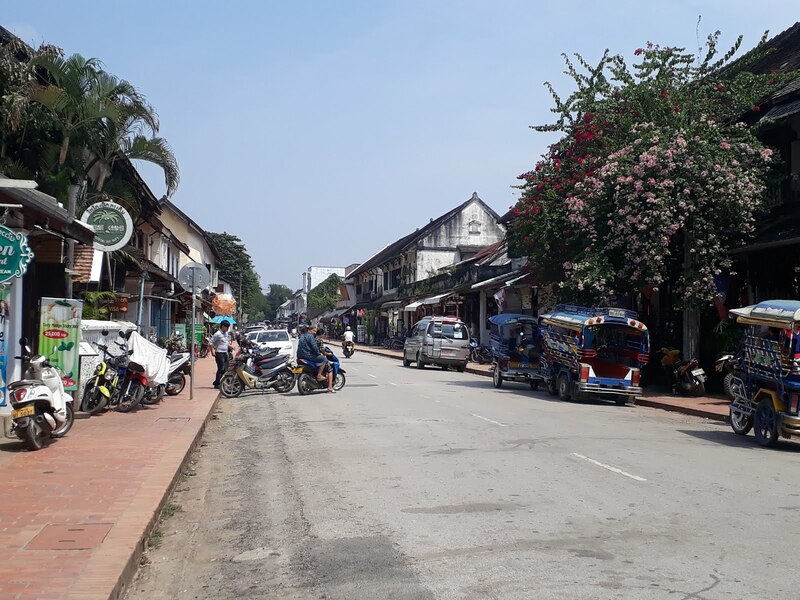 We were picked up by Tuk Tuk from our hotel on time and taken the short distance to the bus station, which was just at the market we had walked through the other day. This time it was a newish minivan, so we thought this would be a nice easy journey. Even though we had paid a ‘premium’ to book the 2 front seats next to the driver, and the 1 behind the driver, we were not really surprised to see that there was one local woman in the front, and 1 woman and a couple of westerners in the one behind the driver. After an initial bit of confusion where some guy took Sadie to the ticket office, checked our ticket which the agent had scribbled on about the seat reservations, a short conversation took place with the driver and some other guy. Next minute, the local was moved from the front seat and went into the back, and the local behind the driver also got moved. The couple next to her (I think it was a German guy and English female) said she wanted to stay there as she suffers from travel sickness, which we understood and when we explained we just needed one seat next to them, everything was ok. There was also one German guy who was also on the previous minivan that we refused to get from Phonsovan, and as it turns out he had the whole back seats to himself (well not for long!). We got going at 08:40 and it wasn’t long when the driver stopped at a phone shop, I suspected we were picking up more people, but as it turned out he was just away to see about his phone, and Jane took the opportunity to move from her ‘booked’ seat to up the back with the German guy, giving her more room as the front middle seat wasn’t ideal for a long journey. The minivan was ok, little short on leg room at the front, but it had air-con and was comfortable enough. This journey was estimated to take around 7 hours, so we thought 8-9 max as usual the times are always underestimated. The first part of the journey was just a double back along the road we came from the other day from Phonsovan, which took us to the split in the road at a little village called Phou Khoun. The other day we did it in 2 ½ hours with the crazy driver, and as time ticked on we didn’t get there till around 4 hours into the journey. 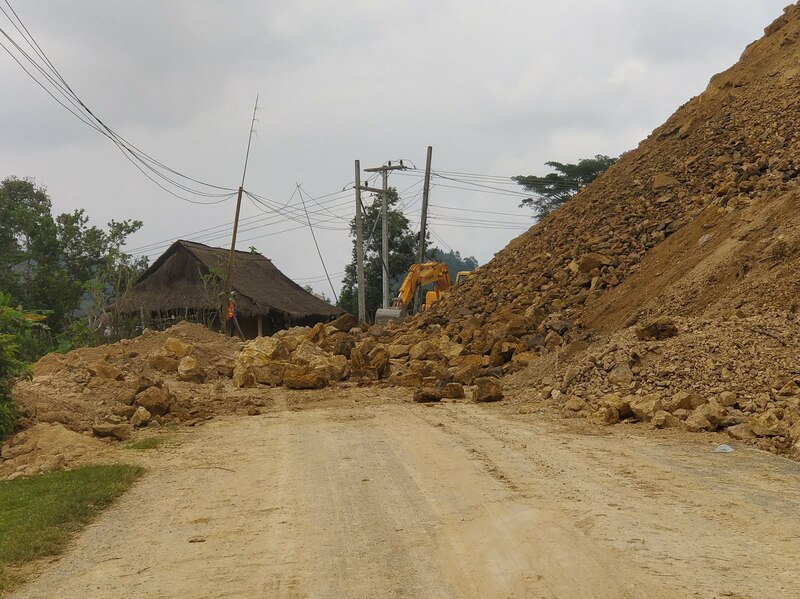 This was due to firstly this driver being ultra-careful (Which isn’t a bad thing) and 1 stop for around 30 minutes for some JCB’s to clear/repair a landslide that we had noticed on the outward journey. This turned into a toilet stop as we all used some woman’s outside toilet at the side of the road, as we waited for the queue of vehicles in front of us to start moving. 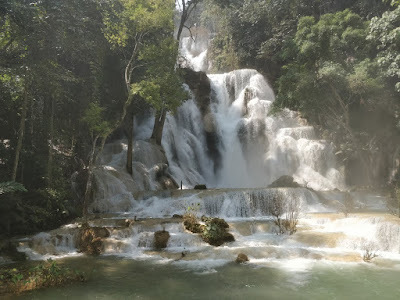 We got to Phou Khoun and stopped for around 30 minutes, despite us asking the driver how long we were stopping for, he just held up 7 fingers which didn’t really tell us anything. So, we bought some crisps, biscuits and cakes and took our seats again for the next part of the journey. 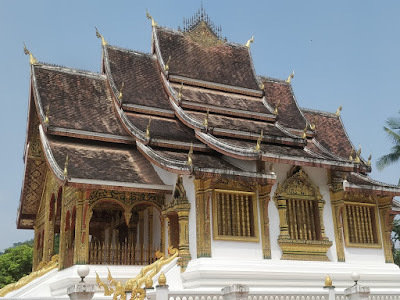 By my estimates, this would take another 4 hours, getting into Luang Prabang around 5pm which would have been fine. Except this next part of road was as equally windy and with 2 more unscheduled stops for ‘landslides’, which resulted in even the girls doing the toilet at the side of the road, it soon got dark and we eventually arrived at the bus terminal around 7pm. By now, we were all fed up, hungry and needing a proper toilet, so we negotiated a Tuk Tuk to our hotel for 20,000kip each and off we set on the last 4km journey of the day. Eventually we got to the hotel around 7.30pm (11 hours after setting off), and we checked in and quickly had a regroup and head out for dinner. Luckily the hotel we were in here for the next 3 nights was bang in the middle of the main part of town, so we didn’t have to wander far to find somewhere to eat. 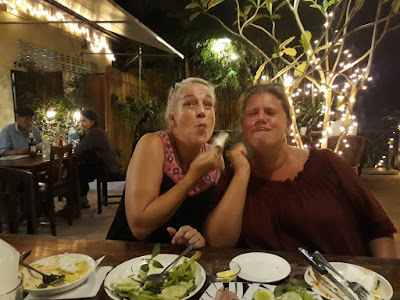 Our first choice, a placed called Tamarind which is highly rated on TA and some blogs had no tables free, but luckily a place next door called Bamboo Tree had a few tables free. A quick look at the menu and we got ourselves seated, by this time we were starving and would have happily eaten anywhere. As it turned out, this place served us amazing food. We got a complimentary sourz shot and some banana crisps/nuts, before our food came out. It was all amazing, and we managed to devour 3 courses (some shared) and drinks and it all came to around £36 which is expensive for here but was well worth it. After that it was an early night after a long day travelling, and we arranged to regroup for breakfast around 8am tomorrow. The next morning, we got up early as planned and after breakfast we went out to explore the town. Luang Prabang is a UNESCO World Heritage site and sits on the River Mekong and its tributary the Nam Khan River. This places most of the old part of the town on a peninsula, which is where our hotel is located, and within 10-15 minutes walking you can get to most places. 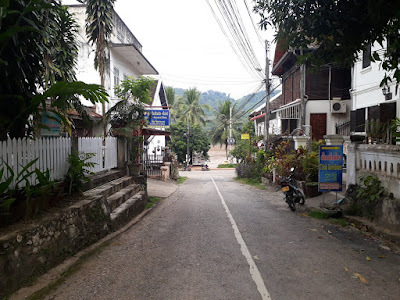 We took a walk along the river to start with, then cut up onto Sisavangvong Road, which is the main road that runs along the whole town and where you find all the restaurants, bars and tour operators. We had 2 full days here, so decided to spend one day exploring the town and the other day we wanted to do a trip. On looking what was available, we picked a half day trip by Tuk Tuk to the Kuang Si Waterfall and the Bear Rescue Centre next door to it and gathered a few prices. We also checked a few places for the cost of the slow boat to the Laos/Thai border at Huay Xai which we would be doing on departing here. 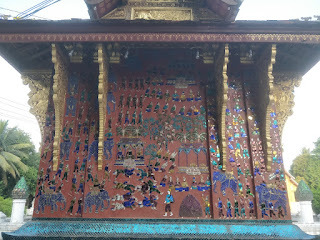 We also visited a couple of temples, one was Wat Mahathat which we pretty much had the place to ourselves. Then we stopped in at the Book Shop/Library where we had a chat with them about their donate a book scheme. You can pay $2 and then pick a book from a small selection of children’s books which get put into a bag, and once they have 100 books, they take them either down the river or in a Tuk Tuk to small villages around the area to help them with their education. Laos is still one of the poorest countries in SE Asia, and every little helps so we get a few books between us and donate them. By now it was getting warm, so we decided to stop somewhere for a nice cold drink and watch the world go by for a while. Walking along the street a bit further, Sadie and Jane discovered the art of shopping again, and obviously as I do not partake in this activity, I conveniently found a drinking establishment directly across the road from where I could view this from! A couple of beers later and as they continue down the street, with me now having a watchful eye on Zenly the stalker app to find out where they stop, I join up with them and we stop at another restaurant called Sena. We get chatting to the friendly waiters, who tell us that their boss is away travelling, and we talk about their steaks and how we might pop back later for one. A few drinks later and we then head back to the hotel for a bit of chill time. Jane and Sadie went out to a temple that apparently had drumming but returned failing to find the correct location/time. Deciding not to climb the hill Mount Phousi which sits in the old town and apparently has good sunset views, we walk along the river and stop at a bar overlooking the hills in the distance and order a cocktail. Well probably the worst cocktails we have had for a while, so quickly leave there and head for the night market which is on Sisavangvong Road. 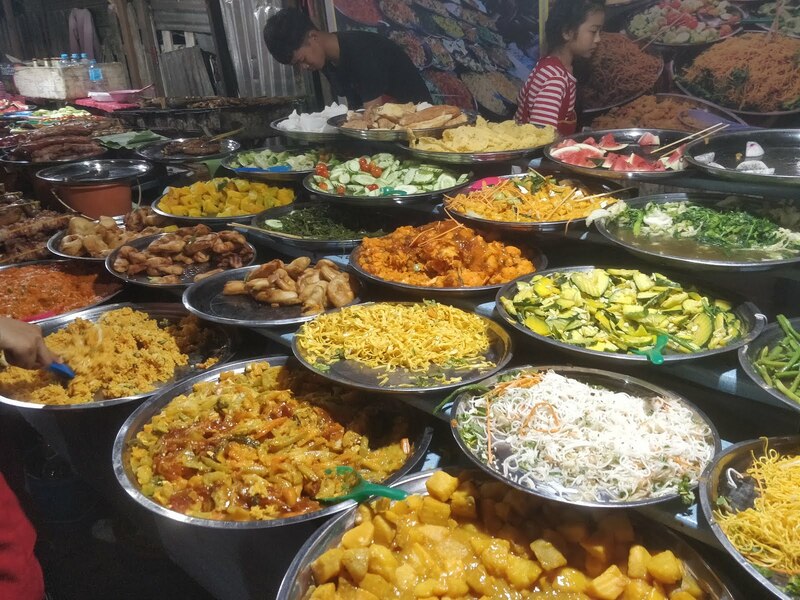 This market takes up a long section of this road every evening from around 6 – 10pm and has the usual tourist items on offer. Jane gets a pair of trousers, and then we head to the Big Tree Café for dinner which we spotted earlier on in the day and was doing G&T’s for 20,000kip. We all went veggie that evening and ordered various small plates to share (Jane being a pescatarian), and it was all delicious, washed down with the gins. Then we head for a place I wanted to check out called Ikon Club, but on the way to that one, we seen a bar that offered a free G&T sorbet with every G&T ordered. Obviously, we had to go in and sample this offer, so we order 3 Tanqueray gins (35,000 each) and 1 can of tonic to share. This of course made the gin quite strong and the free sorbet was lovely. However, when we asked for the bill, they tried to charge us for doubles, and after a short discussion, I paid them 100,000 and we left, not even paying the full price! We then tried to find Icon Klub, however it looked as if it was shut down, so now feeling a bit merry, headed back to Sena for more drinks. Not sure how we ended up chatting to the 3 lads who worked there about going to a club, but 11pm came and as they shut the bar, we were then on the back of a scooter each with them and zooming along the streets to some night club in the middle of nowhere called Dao Fu. It was free entry and for a Wednesday evening, remarkably busy with mainly locals and some Chinese tourists. Am pretty sure we were the only Europeans in there, and it was a huge place. 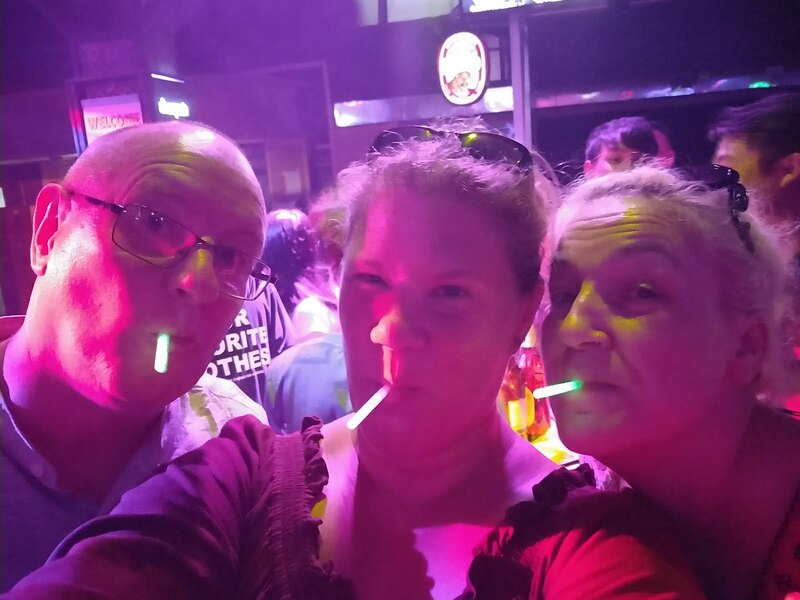 We get some beers ordered, 3 bottles between the 6 of us and one of the lads comes back with some glow stick lollies for us! A few more beers after that and we then decided we would head back to the hotel not long before 1am. We probably only spent around an hour or so there, it was good laugh (especially Janes dancing and Sadies headbanging - see the video!) and the guys left with us, we wanted them to get us a taxi but they insisted and drove us all the way back to the hotel, which was a nice thing to do. Staggering into the hotel, we all decided that the trip we had arranged for tomorrow was going to be fun with a hangover, but we still set our alarms for 7am! We had booked a Tuk Tuk to take the 3 of us to the waterfall and bear centre for 200,000 Kip (£6 each) and he picked us up on time after breakfast. Just as we were heading out of town, we stopped at a junction and low and behold I spotted Bronwyn and her sister, along with 2 other friends. 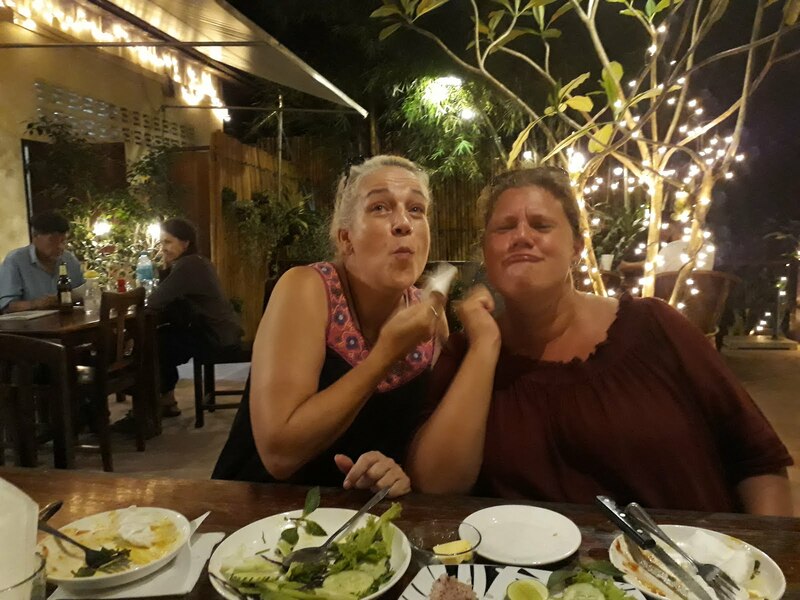 Quite remarkable as this was now the 3rd time of randomly bumping into her in Laos since we first met at the border, and even more strange is that the 4 of them were looking to get transport to the same places we were going. After a quick discussion with our driver, and a slightly higher rate of 300,000 for the 7 of us, we set off on the 45-minute journey. Our driver asked us if we wanted to stop at a Traditional Mhong Village on the way, to which we agreed. In reality it was just a sales pitch where you had to walk along a narrow street past lots of kids dressed up in traditional outfits trying to sell you bracelets, bags etc. 10 minutes later and we all get back onboard and head off to our destination, and when we arrive our driver said he would wait here for us for a few hours and pointed us off to his sisters shop for water/toilet. 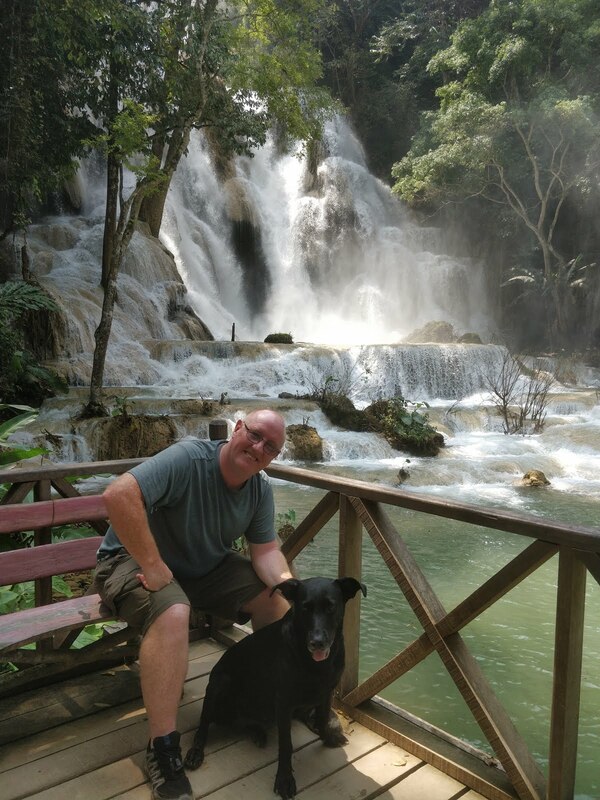 We paid our 20,000 kip each entrance fee, and as we were about to walk in, a black dog came up to us and started sniffing and trying to stick its head between our thighs. It was cute and after we gave it a few minutes attention, that was an indication to it that we were its friends for the day, as it followed us into the park. The bear rescue centre is primarily for moon/sun bears who are poached in Laos for their bile and kept in horrendous conditions on bile farms in tiny cages. This NGO rescues them and gives them somewhere safe and secure to continue their lives. Sadly, they can never be released into the wild again (well not till this illegal practice is stopped) and are well looked after, sadly in caged enclosures. However, they are large and with now having 43 to look after, they are expanding as fast as they can to accommodate them. We learned a bit about them from one of the female English-speaking staff there, who also told us about our new dog friend, and she apparently does this regularly and attaches herself to tourists for a walk. So, we look at the bears for a bit then all head up towards the waterfall, where Bronwyn had been told that the path that goes up to the right gives a better view. We head up to the right at the split in the path, and this then takes us up through the jungle, over streams and muddy paths, dead ends and then we eventually end up at a wooden bridge that goes over in front of the waterfall. This one was amazing, must have been about 100m high with multiple levels and fast cascading water. Quickly realising that if we took the left path, it would have been easier and brought us to the same place, we then decide to climb to the top of the waterfall. 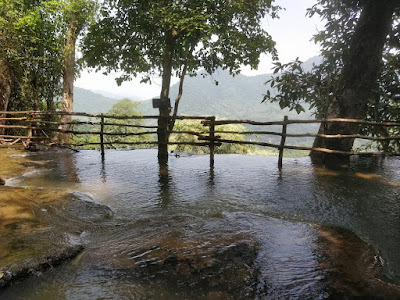 Again, we had a choice of 2 paths, this time we went up the steps to the left and as it zig-zagged across getting higher, we suddenly came to some steps that were actually part of the waterfall, with fast running water coming down them. It looked amazing, and we got our shoes off and started the ascent. 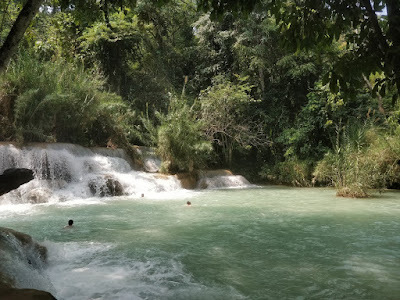 It probably took around 30 minutes to get to the top, where there was an area you could swim, and a small boat that allegedly took you to the source of the waterfall. Sadie and Jane were the only 2 who paid their 10,000 to go see this but came back saying they didn’t see it as the water flow was too fast. After taking in the amazing views from up the top, some of us took the path back down the right that took us in a loop to the bottom, whilst the others went back down the same path we came up. The one we took got us back down in 10 minutes, it was a lot steeper but more direct, and we all said we are glad we didn’t pick that one to climb up! We stroll back down the easier route to the entrance again, and only then we noticed all the nice swimming areas in the falls, set amongst the multiple levels all the way down. It was stunning, but by this time our 3 hours were close to being up, and we headed back down to get our lift back to town. And we dropped the dog off at the same place we got her, told her to sit and she did just that… good girl! When we got back to the hotel it was around 3pm, and I wanted a shower and some chill out time, so Sadie and Jane got organised then headed out to a temple to try find the drumming again (which again they failed to find, but did see an amazing temple apparently!). In the afternoon, we had also booked our slow boat to Thailand tickets, paying 270,000 kip each (£25) for the 2-day journey up the Mekong. Once we were all refreshed, we headed out back to Tamarind for dinner which wasn’t as busy that evening, however Jane and Sadie were disappointed in both their meals, but my BBQ Buffalo was lovely. After the shenanigans of the previous night, we all wanted a quiet evening and after dinner we just went back along the night market for a last look. We also picked up some snacks and water for the journey tomorrow - a couple of filled baguettes, pork dumplings and coconut pancakes. Then it was back to the hotel. We also had to remain sensible as that night at midnight, the Glastonbury Festival coach tickets went on sale, and we had committed to trying to help the groups get their tickets secured. However, out of the 100+ of us all trying, only 1 group out of the 7 got tickets, so this makes the main sale on Sunday even more worrying/stressful. By now it was 1am, and with an early start at 7am, we all headed off to bed.